Herbal treatment involves ingestion of various herbal supplements to improve physiologic function. It is part of complementary and alternative medicine. Complementary and alternative medicine is defined broadly as medical practices not taught widely in medical schools. It has been found that herbal treatment for gastrointestinal disorders has been used by at least 50% of gastrointestinal outpatients in a community setting to relieve their symptoms. Complementary and alternative medicine is a group of healthcare practices that is not considered part of conventional medicine. It has been found that nearly 50% of the US population use some form of complementary and alternative therapy. Regardless of the therapy employed, the overall philosophy of complementary and alternative medicine takes a uniform holistic approach that all diseases results from disturbances at a combination of physical, psychological, social and spiritual levels. Thus complementary and alternative medicine is used to restore balance and to facilitate the body’s own healing responses, thereby relieving troublesome symptoms. Gastrointestinal disorders rank among the most common disease states for which people seek the advice of complementary practitioners. 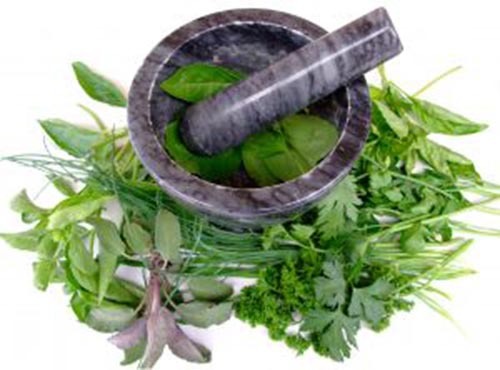 Herbal therapy is a form of complementary and alternative therapy that uses plants and plants extracts for healthcare. According to World Health Organization more than three fourth of the world population use herbal therapy. Herbal treatment for gastrointestinal disorders involves using herbal supplements for relief of gastrointestinal symptoms and to improve physiologic function of the gastrointestinal tract. Herbal therapy is given in the form of supplements, teas, tinctures, creams and poultices. Nausea is an unpleasant sensation of that is recognized as a feeling of impending vomiting in the abdomen and throat. Vomiting is a partially voluntary act of forcefully expelling stomach and intestinal content through the mouth. Ginger is the herbal supplement most commonly employed to relieve nausea and vomiting. Ginger can be used to treat vomiting due to morning sickness, sea sickness, chemotherapy and surgery. Although ginger is found to be effective in controlling nausea and vomiting, it has been found to cause some potential side effects. It increases the risk of bleeding especially in those who take medications like Aspirin and clopidogrel. Anecdotal reports say that it can cause mutation and affect the growing fetus. But this is not proven by studies. Dyspepsia is defined as persistent or recurrent pain or discomfort centered in the upper abdomen. Functional dyspepsia refers to persistent or recurrent dyspepsia in patients who have undergone various tests including endoscopy and have not been found to have an obvious cause of their symptoms. Banana promotes gastric mucus secretion and has been found to relieve symptoms of ulcer disease. Capsaicin is derived from the dried fruit of red pepper. It blocks the signal conduction in nerve fibers that carry the sensation of pain from the abdominal organs to the brain. It has been found to improve symptoms like upper abdominal pain, nausea and bloating. Greater Celandine, which is also called as tetterwort has the property of relaxing smooth muscles in the gastrointestinal tract. It can be used for the relief of colicky pain. It can cause side effects like dryness of mouth, sleeplessness, diarrhea, fatigue and liver toxicity. Liu Jun Zi Tang, which is also called as TJ 43 is a Chinese herbal medicine that has been frequently used to treat functional dyspepsia. It provides relief from abdominal bloating, acid reflux and nausea. The only adverse effect noted with it is the development of interstitial pneumonitis in which the lungs are affected. Peppermint and Caraway prevents smooth muscle contractions. Several studies have shown that they provide relief from abdominal bloating and pain. The side effects include diarrhea, allergic reactions and worsening of asthma. Among the herbal supplements used to treat functional dyspepsia, these two supplements are the extensively studied supplements. Shenxiahewining is a Chinese herbal preparation which contains many Chinese herbs like Ginseng, Pinelliae, Zingiberis and Glycyrrhizae. It provides relief from functional dyspepsia. Tumeric has been found to provide relief from the symptoms of functional dyspepsia. It increases secretion of bile, promotes contraction of gallbladder and act as an antispasmodic providing relief from colicky pain. It can cause fatigue and headache. Irritable bowel syndrome is defined as abdominal discomfort and altered bowel function in the absence of structural and biochemical abnormalities. Psyllium is the most commonly prescribed supplement for patients with irritable bowel syndrome. It adds to the bulk of the stool and facilitates bowel evacuation. Peppermint oil prevents smooth muscle contractions and can be used for relief from abdominal pain associated with irritable bowel syndrome. STW 5 is an herbal preparation that contains bitter candytuft, chamomile, peppermint, caraway fruit, licorice root, lemon balm leaves, celandine and milk thistle. It has got antispasmodic properties and has been found to be effective in the treatment of irritable bowel syndrome. Inflammatory bowel disease is a group of inflammatory diseases affecting the gastrointestinal tract of which ulcerative colitis and Crohn’s disease are the common types. Curcumin is extracted from turmeric. Studies have shown that it has got antioxidant properties and provides symptomatic relief in patients with inflammatory bowel disease. Aloe vera is a medicinal plant. Studies have shown that oral intake of aloe vera for 4 weeks provide clinical relief in patients suffering from ulcerative colitis. Pycnogenol is an extract from the bark of French maritime pine tree. It has got antioxidant properties. Studies have shown that Pycnogenol provides symptomatic relief and can be used as a supplement in the treatment of inflammatory bowel disease. Other herbal supplements used in the treatment of inflammatory bowel disease include fenugreek, slippery elm, tormentil, devil's claw, Wei tong ning and Mexican yam. These supplements have antioxidant and anti-inflammatory properties which provide symptomatic relief in patients with inflammatory bowel disease. In complementary and alternative medicine constipation and diarrhea are grouped together under the term colonic health. Aloe acts as a stimulant laxative. It promotes intestinal motility and relieves constipation. Apple pectin is rich in fiber and it adds to the bulk of the stool and helps in evacuation of bowel. Cascara is a stimulant laxative. It promotes intestinal motility and relieves constipation. Fennel has got intestinal motility promoting and antispasmodic properties and helps to relieve constipation. The other supplements which promote colonic health include hibiscus, Oregon grape, psyllium, raspberry, rhubarb, Senna, spirulina and yellow dock. Complementary and alternative medicine is commonly used to treat hepatitis B, hepatitis C and alcohol induced liver disease. Milk thistle is the most commonly used herbal preparation in the treatment of hepatitis due to viruses, alcohol and medications. Silymarin is the active ingredient of milk thistle and it has got antioxidant and anti-inflammatory properties and also slows down the scar formation in liver. TJ-9 also known as xiao- chai- hu- tang in China is a combination of seven herbs. This herbal preparation has got antioxidant properties and also prevents scar formation in the liver. Pylllanthus amarus inhibits the multiplication of hepatitis B virus. It acts by inhibiting the enzyme HBV DNA polymerase. The other herbal supplements that have been found to be effective in the treatment of viral hepatitis include fuzheng jiedu tang, kurorinone, Jianapi Wenshen, thymic extract, licorice and Picrorrhiza kurroa. Estimates are that up to 64% of the adults with cancer employ complementary and alternative medicine at some point during their treatment. Studies have shown that green tea help prevent adenomatous polyps in the colon and chronic atrophic gastritis. Adenomatous polyps lead to colon cancer and chronic atrophic gastritis leads to stomach cancer. Garlic has been found to prevent the development of stomach cancer. It is found to have antibacterial effect against the bacteria Helicobacter pylori. Helicobacter pylori has been proved to cause stomach cancer. Lycopodium clavatum is a type of fern moss. There are reports that it is effective in the treatment of rectal cancer pain. how do I get rid of liver flukes? Is acupuncture a CAM-only technique?